Chinese President Xi Jinping reportedly asked his nation's air force to hasten its integration of air and space capabilities. During a visit to the air force headquarters of the People's Liberation Army in Beijing on Monday (April 14), Xi urged the development of a "new-type combat force" and told military leaders they need to be able to deal with air and space emergencies "swiftly and effectively," the English-language newspaper China Daily reported. The news report gave few details on how Xi wanted to strengthen the military use of space. Some of the Chinese media framed Xi's request as a response to actions by the United States and other world powers. China Daily quoted Wang Ya'nan, deputy editor-in-chief of Beijing's Aerospace Knowledge Magazine, as saying: "The United States has paid considerable attention and resources to the integration of capabilities in both air and space, and other powers have also moved progressively toward space militarization. Though China has stated that it sticks to the peaceful use of space, we must make sure that we have the ability to cope with others' operations in space." China became the third country — following the former Soviet Union and the United States — to independently send humans into space and put a spacecraft on the moon. But China's space program has raised some concerns among U.S. observers. 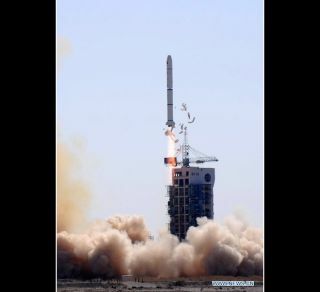 The Chinese government received widespread condemnation after conducting an anti-satellite (ASAT) test in 2007 without advance warning to foreign powers. During that test, China blew up one of its own satellites, creating about 3,000 new pieces of space junk in a heavily used part of Earth's orbit. In a report to Congress last year, the Pentagon noted that China was continuing to ramp up its military capabilities in space, with 18 space launches in 2012 and an expansion of its space-based intelligence, surveillance, navigation, meteorological and communications satellite networks. That report from the U.S. Department of Defense also claimed that China had improved capabilities "to limit or prevent the use of space-based assets by adversaries during times of crisis or conflict." China may even have its own equivalent of the U.S. Air Force's mysterious X-37B space plane: the secretive spacecraft known as Shenlong (Mandarin for "Divine Dragon), which reportedly embarked on its first test flight in 2011.